If Coldplay are trying to win over more fans (and Brits votes) by offering a free live album, they're a tad too late. The 2009 Brit Awards takes place tonight and all bets are off. 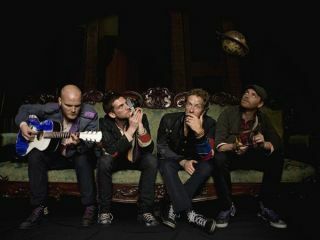 In reality, though, Coldplay don't need to bribe. So let's just give Chris Martin's sincerity the benefit of the doubt: "What we want to do is try to giveaway a live album for free," Martin told The Sun. "We're playing a lot of shows in the summer and I think what we would like to do is - bearing in mind the recession we are in - record the live album then give it as a gift." "It's a way of saying thank you - It's a tough economy and people are paying a lot of money for tickets." So there you go: if you've got a ticket to see Coldplay (and the band manage to wade through the complications of "record contracts and things"), you might get a free live recording of a previous show. And then you can flog it on eBay to pay for that over-inflated gas bill, presumably.